Maxima Chain Guard is an advanced chain lubricant specifically formulated for today's on and off road, high performance motorcycle chains. It is compounded with the finest synthetic lubricating bases and reinforced with the most advanced anti-wear and extreme pressure additives available. It also contains special additives to prevent "fling-off" and protect against rust & corrosion. 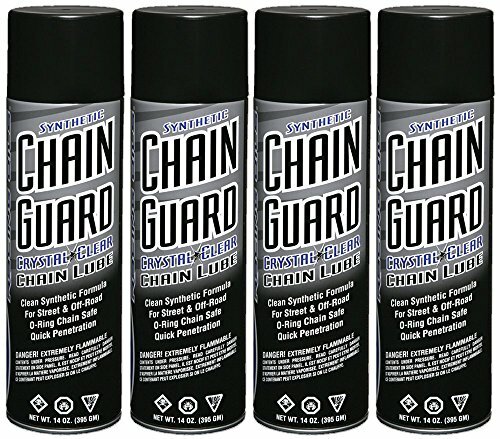 Chain Guard is O-ring safe and makes an excellent lubricant for all motorcycle control cables. Clear Formula won't cover up a brilliant chain, ideal for Gold and other Color chains. CAUTION Flammable! Do not spray near open flame. Avoid prolonged exposure to solvent vapor. See warning on container. FEATURES Extends chain & sprocket life Easy application Race proven protection Will not fling-off Waterproof & heat resistant Safe for all O-ring chains Excellent rust & corrosion protection.